We had a great time with family yesterday. I hope you did, too. As I mentioned in an earlier post that since our daughter's family is here for Thanksgiving and won't be for Christmas I decided to decorate the house early for Christmas. We were able to pick up our tree--it is 11 feet tall--on Wednesday. We immediately set it up in the living room so the branches could come down from being wrapped tightly for transport. 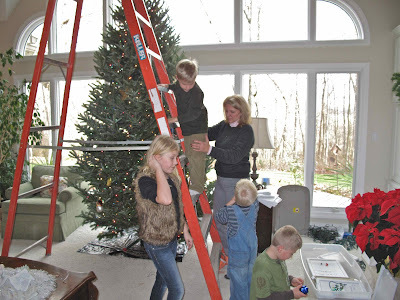 Since my sister volunteered to put the lights on--which I really don't like to do, we brought in the ladder and left the bare tree standing till after Thanksgiving dinner. 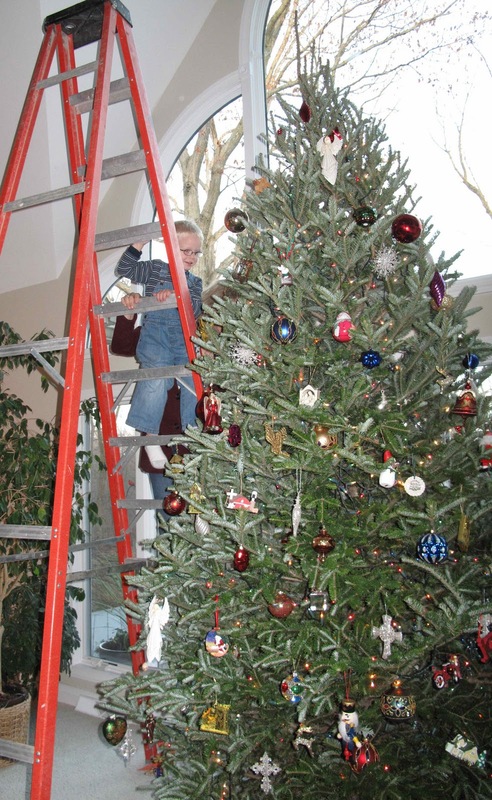 She did a great job with the lights even though there were a couple of problems with extension cords burning out. 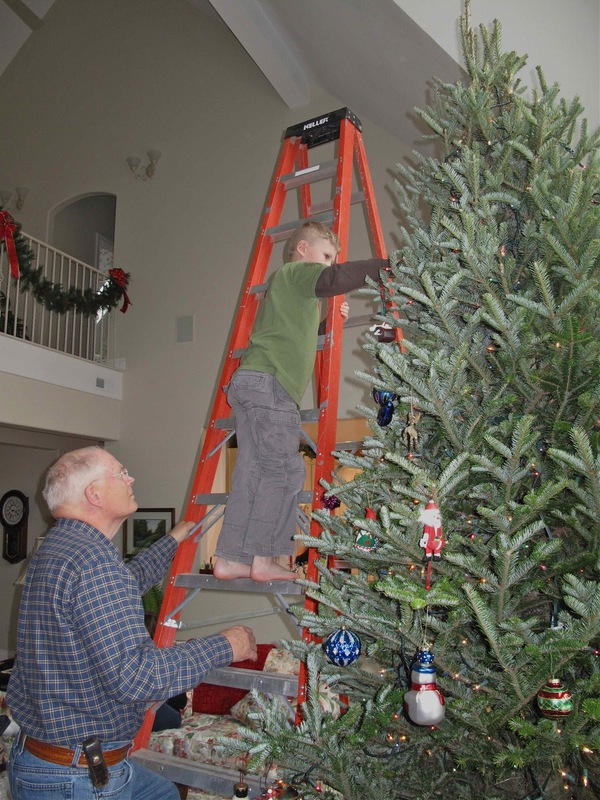 The tall ladder was a great attraction for the grandchildren so I had lots of help hanging the ornaments. It was fun and an opportunity to make memories. Our daughter's family are on their way to Illinois to spend Thanksgiving with us. When I talked with her this week she said the boys are both excited to see us and have lots of things on their agenda to do while they are here. I'm sure that helping Granddad "pick" the eggs and feed Bud, and riding the F-150 and the off-road trike are some of the things they are looking forward to doing. But they also want us to see their new looks. Gage, who is 3 years old, and Gavin who is 5, each have something different to show us about their faces. Gavin lost his first tooth a couple of days ago, and Gage is now wearing glasses. He told his Mom he will wear the glasses into the house when he gets here and then he will take them off and say, "Now do you recognize me?" Gage's need for glasses was discovered when he went with his brother to a routine eye screen for kindergartners. Because of his new ability to see the world clearly he seems to feel like an entirely different person and therefore he thinks we may not recognize him. How wonderful his inability to see clearly was discovered at such a young age! Our daughter was saying that they put up Christmas decorations Monday which included a little tree in the boys' room. When they went in to check on the boys and to turn off the tree lights before going to bed themselves they found Gage asleep with his glasses on. He had been admiring the beautiful lights as he fell asleep. A whole new world has been opened to him since he got his glasses! As I was writing this I was reminded of 1 Corinthians 13:12 which in the King James version says "we see through a glass darkly" but I especially like The Message translation: "We don't yet see things clearly. We're squinting in a fog, peering through a mist. But it won't be long before the weather clears and the sun shines bright! We'll see it all then, see it all as clearly as God sees us, knowing him directly just as he knows us!" Gage's experience with new glasses illustrates this verse so well and helps me to understand it better. How different things will look to us when God helps us to see clearly! 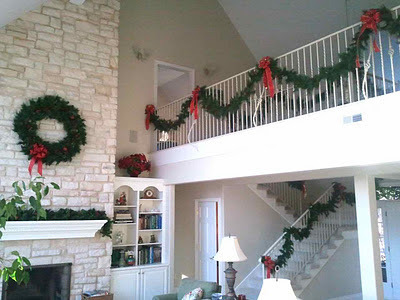 Since our daughter's family will be coming for Thanksgiving and not Christmas, and therefore I will be having lots of people here for Thanksgiving dinner, I decided to do my Christmas decorating early. That's why I haven't had much time to write this week. I have been dragging out all my decorations, sorting through them, throwing away some and looking for new. I'm almost through except for the tree. We've always purchased a real tree to decorate for Christmas so I called a tree seller who said they are expecting their trees to arrive next Tuesday. I thought if I could get everything else decorated now, then hopefully I would have time to do the tree on Wednesday before everyone comes for Thanksgiving dinner on Thursday. I may have trouble accomplishing that while preparing for guests, and cooking some things ahead, but I'm going to try. At least the rest of the house will look festive--even if it is decorated for the wrong holiday. Here is a picture of the main area I've done so far. I'm beginning to feel encouraged about the results. I was feeling a little sad Friday night and yesterday. I know it is irrational, but I couldn't seem to help myself. Let me explain. Last week on Wednesday as I was working on my computer in the living room I happened to catch something move in the corner of my eye. 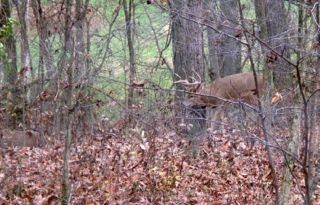 I glanced out the window and saw two big bucks in the woods at the edge of the yard. I grabbed my camera and took pictures as I watched them for several minutes. I snapped the picture below as the largest buck (and I) was about to discover a doe lying in the leaves. As you can see she looks like a large rock in the left side of the picture. I wish the picture was a little clearer, but I was shooting the photos through the glass of the window. You get the idea though. It was such a blessing to watch this little scene from nature right outside my window. I continued watching for quite some time and in the process discovered there were actually 4 bucks following her scent. 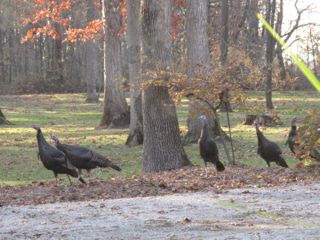 Then on Friday I looked out a window into the front yard and discovered they were back. I didn't see any does, but I saw the bucks at different intervals as one would walk off into the woods and shortly another would come behind him. I guess seeing them twice in one week made me feel they felt safe and protected on our property since it is bow hunting season. And somehow I felt responsible for their security. Of course I know that's ridiculous because it is a known fact that a buck will follow a doe anywhere at anytime for long distances once he catches her scent, but feelings don't always follow rational thoughts. Supposedly this time frame we're in right now is the peak of mating season and therefore a great opportunity for hunters to snag some unsuspecting bucks who have their minds on things other than watching out for hunters, so Friday afternoon my brother showed up to go bow hunting. He has had permission to hunt on our land ever since we've lived here. Anyway, to my brother's delight, he killed the biggest of the bucks. When he told me, I'm afraid I didn't share his enthusiasm, and then I was sad for awhile. I'm pretty much over the sadness now. I know shotgun season starts next week so someone else probably would have shot him. I'm glad that if it was going to happen that my brother was the one to do it. He was so happy! He said it is the biggest buck he has ever killed with a bow--and he has done a lot of hunting and has many deer head trophies to prove it! I have to say, though, that I still haven't gotten to the point of enjoying seeing any of God's creatures dead, so when it happens it helps me to spend a little time mourning the loss of their beauty. On November 11–12, 2011, thousands from across America will gather to Ford Field (Home of the Detroit Lions) to fast, pray and cry out to God. We will gather to this city that has become a microcosm of our national crisis—economic collapse, racial tension, and the shedding of innocent blood of our children in the streets and of our unborn. But the place where they say there is no hope, God has chosen as His staging ground for a great communal healing and His house of prayer for all nations. Therefore, we are calling the nation to a 24-hour solemn assembly, daring to believe that Detroit’s desperation can produce a prayer that can change a nation. Come and take your place on the wall in Detroit, where we will ask God to send fire on our hearts, to forgive our national guilt and establish justice in our land. Since we are unable to go to Detroit for this meeting we will be joining our hearts and spirits with them tonight at our house to pray for revival in this land. I feel this is an extremely important meeting. God answers prayer. He says in II Chronicles 7:14, "if my people, who are called by my name, will humble themselves and pray and seek my face and turn from their wicked ways, then I will hear from heaven, and I will forgive their sin and will heal their land. I believe we are at a crucial time in our nation when we must we take God at His Word and seriously pray for our country. If you are feeling that also, please come. We are planning to worship and pray a couple of hours unless the Lord leads otherwise. I have always loved Paul Harvey and of course I love farmers, so I am posting this video as a tribute to both of them. Yesterday I spent quite a bit of time on the internet looking for a good video commentary on Colossians. We have been talking in The Gathering that our main purpose and desire is to be focused on Jesus, who He is, what He has done, what He says for us to do. We have been thinking we need to be studying the Bible consistently to know these things. Since Colossians has a wonderful passage that sums up who Christ is I thought that book might be the best place to begin, so I was trying to find some enlightening video teaching on it and other books of the Bible that we could watch and learn from as a group. The website says these sermons/commentaries are done by Dr. Bob Utley, a pastor in Texas, who, "as a local pastor, taught verse-by-verse through New Testament books on Sunday evenings and through Old Testament books on Wednesday evenings. All these teachings became the "Video and Audio Bible Commentaries" which are now available through this free website sponsored by Bible Lessons International." What convinced me to listen to some of the sermons, though, was this comment: "He approaches Bible teaching from an exegetical, verse-by-verse, historical- grammatical point of view. In addition, great effort is made to remove his, and our, social, cultural, experiential, and denominational biases. Bob tries to support his interpretation from the biblical text in one of six ways: (1) literary context; (2) historical setting of the biblical author; (3) word studies; (4) grammatical relationships; (5) parallel biblical passages; and (6) literary genres." That sounds like the kind of teaching I need to hear and from which I could learn much. Country Guy and I downloaded and watched one of the sermons last night which we think could have been one of the best we've ever heard. It is entitled, "The Bible is Eastern Literature." We are thinking it would be a great one to watch at The Gathering Sunday night at 6:00. (It seems our agenda may be changing--but didn't I say that might happen?) We are thinking of doing the Mark Virkler series at a different time--possibly Wednesday nights--and then we could begin studying the Bible on Sunday nights. Come hear Bob Utley Sunday night, if you can. I think it will change your perspective on what it means to be a Christian and get you excited to study the Bible along with him as we watch other videos. I couldn't resist adding verses 21 and 22 here because they tell us the great news that through Christ's sacrifice on the cross our relationship with God has been restored. Hallelujah!! Col. 1:21,22. "This includes you who were once far away from God. You were his enemies, separated from him by your evil thoughts and actions. Yet now he has reconciled you to himself through the death of Christ in his physical body. As a result, he has brought you into his own presence, and you are holy and blameless as you stand before him without a single fault." Feelings Buried Alive Never Die, cont. I am enjoying this book (see Sunday's post) very much. It seems to answer some interesting questions, like why do some people get sick while others stay mostly healthy. Even though it is not written as a Christian book, many of the concepts can be related directly or indirectly to scripture. For instance, here is a quote from Hands of Light by Barbara Ann Brennan: "Illness is the result of imbalance. Imbalance is a result of forgetting who you are. Forgetting who you are creates thoughts and actions that lead to an unhealthy life-style and eventually to illness. The illness itself is a signal that you are imbalanced because you have forgotten who you are. Illness can thus be understood as a lesson you have given yourself to help you remember who you are." This quote makes me think about who God says we are and what Jesus did for us on the cross. He said that by His stripes we are healed. Illness causes me to pray which reminds me who I am--a child of God--and what He has already provided for me if I am walking according to His will. Dr. Bernie Seagel says in Love, Medicine, and Miracles, a book I read years ago and loved, "I suggest that patients think of illness not as God's will but as our deviation from God's will. He then goes on to say, "I feel that all disease is ultimately related to a lack of love, or to love that is only conditional, for the exhaustion and depression of the immune system thus created leads to physical vulnerability. I also feel that all healing is related to the ability to give and accept unconditional love. I am convinced that unconditional love is the most powerful known stimulant of the immune system. If I told patients to raise their blood levels of immune globulins or killer T cells, no one would know how. But if I can teach them to love themselves and others fully, the same changes happen automatically. The truth is: love heals." I am interested and excited to be learning ways I can unearth some of my buried feelings to become a healthier and more loving person. If this interests you, too, I recommend this book. What an exciting football game we attended this afternoon! Our grandsons, Daniel & Parker, play football with the Marshall football team. Marshall had an undefeated season this year so they are now involved in the state championship playoffs. This afternoon was the 2nd game of the playoffs. We played Bismark-Henning. Marshall led most of the game, 14-0, but then in the 4th quarter Bismark scored two touchdowns and went for 2 points on the last one to bring the score to 15-14 with 17 seconds left to play in the game. Almost everyone watching the game thought it was over, but we had a wonderful surprise awaiting us! Bismark kicked off to Marshall and the clock started ticking. Marshall threw an incomplete pass, but pass interference was called on Bismark so the penalty moved the ball closer to Marshall's goal on the play. With only 6 seconds left, the Marshall's quarterback sent the ball flying for a long pass from the 42 yard line to a player near the end zone. The ball was slightly out of reach of the player who tried to catch the ball but instead tipped it. The clock buzzer rang just as another Marshall player dove for the tipped ball, catching it on the ground in the end zone for a touchdown and Marshall won 20-15. Absolutely amazing! Now Marshall is 11-0 for their season wins. I really believe the Lord is showing me something with 11's. Remember the World Series game we attended which I wrote about a few days ago, when the Cardinals won the 6th game of the series in the 11th inning and then went on to win their 11th World Series Championship in the year 2011? Both the Marshall game and the Cardinals game seemed to be miracle wins. I'm wondering if the message isn't that we are never to give up--that when things in our lives look impossible and we are about to despair, to remember that all things are possible with God. Could that even be a message for our country? I believe The Call Detroit, a 24 hour solemn assembly to be held at Ford Field in Detroit is another important eleven. The date for the assembly is 11-11-11 to 11-12-11, 6:00 p.m. to 6:00 p.m. I think another reason I am seeing so many elevens is to be reminded to pray, particularly on 11-11-11 with the thousands who will be gathered to pray and fast for our nation. I won't be able to go to Detroit, but I plan to join with them on 11-11-11 to pray and fast here at home. Would you consider joining us? We are planning a special meeting of The Gathering, Friday evening at 6:00 for the purpose of praying for our community and for our nation. Please come if you can. As of right now, we are calling our new adventure, The Gathering. We will check on the availability of that name when we apply for our tax ID number. Hopefully, it is available. We feel the name is a description of what we are doing. We are a group of people gathering to know Jesus at a deeper level. It is our desire to allow the Holy Spirit to teach us how to be Jesus' disciples because we know He said we are to go into all the world to preach the word with power, and signs and wonders will follow, and we don't see that in many churches today. We are gathering together to learn what, when, why, and how He did the things He did, and to practice allowing Him to do the same things through us. We expect this will happen through loving one another and sharing testimonies, inviting guest speakers, watching DVD series of anointed teachers, worship, prayer, and any other way the Lord leads. It is our desire that each meeting will be Spirit-led, so there will be no set schedule--only a loosely held agenda. Since we do not see ourselves as a church--in the commonly held definition of the word, but only a group of people gathering to know Jesus at a deeper level, and to learn to do the things he did, it seemed to us the best time to meet would be Sunday nights at 6:00, so as not to be in competition with churches in the area. All who are searching for, and desiring more of God, are invited to come whether you regularly attend church or not. This is for everyone, who, deep in his/her heart, knows there is something more and wants to experience it. Jesus said He came to give us abundant life. If you aren't experiencing "abundant life" then come learn how with us at The Gathering. It will be an exciting, life-changing adventure for all of us. Our plans are to begin this Sunday night watching the DVD series "Seven Prayers That Heal The Heart," with Mark Virkler. (As I mentioned, though, our plans are subject to change if the Holy Spirit leads us a different way.) It seemed to us this DVD series would be good to begin with because it's our desire to be free of anything that keeps us from loving, knowing and serving God. We know that through things that happen to us in life we make wrong decisions and feel regret, or we get hurt, feel rejected, and can't let go of our anger because of our pain. This series will help us pray through, and release those things that hinder us from doing what Jesus said to do. We invite you to come participate with us in becoming all that God created us to be--representatives of His kingdom on earth. I don't know about you, but I feel a real sense of responsibility to not misrepresent him, and I know that I have, and I do. I want to learn to be a better disciple. I would be glad to answer any questions you have if you want to email them to me. I hope to see you Sunday. I have been working practically non-stop on my new cookbook. I had no idea it would take so much time! One thing led to another and before I knew it, I had put in many hours for several days straight, typing, reading, re-arranging, proofing etc. Then I had to move everything I had done to a different word processing program because I used Pages and the publishing company wanted it to be in Word. Each section of the cookbook had to be in a separate document so I cut and pasted to create the required divisions. Then I realized the way my new computer works--with which I've barely had time to become acquainted--is that every time I tell it to save something in Word, it creates a new document. As I went back to read the sections several times and made corrections, of course, I told it to save the changes. What I didn't realize until I had saved several was that it was saving each bunch of changes in a new document! It became very confusing and time-consuming to discover which was the last document I had saved and to send the others to the trash. I have had lots of encouragement in what to include, and some new additions submitted by my extended family, so it looks as if the count--as best I could tell--is 249 recipes. When my cousin read about the cookbook on the blog she emailed me to ask if I would add our grandmother's orange bread recipe. I mentioned it to Mom, who had a copy, and then Sandra sent one, too, so I was able to include it. How fun to have old recipes mixed in with the new! I was even able to add Meredith's recipe which she contributed under "comments" on the original cookbook post a few days ago. I am always thrilled to have readers' participation! After talking with family and friends, I am assuming there may be a few extra copies, so if you are interested in reserving one, let me know. It looks as if the cookbook will cost less than I had originally thought because I ordered a larger quantity. I think the price will be around $10 shipped, or about $7-8 if you can pick it up. I still don't have the final cost yet, and I don't know how much shipping is, so I will let you know when I do. As I was sitting in the living room yesterday with my computer on my lap, working on the cookbook, I happened to look up. This is the sight I saw out our front door. Of course, I had to get my camera. I have accused the raccoons of tearing up the mulch there, but it looks as if they have had some help.